Still working on the large painting, but did this one as a quick warm up. A while ago I did a series of color studies with tree trunks as the subject. It was a simple subject, but worked well to display the effects of color choice. 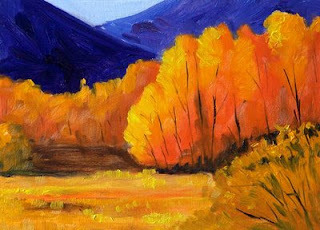 This 5x7 inch oil painting was created using Ultramarine Blue, Cadmium Orange, and Cadmium Lemon Yellow. In this particular study I used a different brand of Cad Orange. My last set of studies I used Windsor & Newton Cad Orange. In this study I used Gamblin. Although I usually prefer Gamblin oil color to Windsor & Newton, I have to say I prefer the W&N Cad Orange to the Gamblin. The W&N is just a little deeper leaning toward red. The Gamblin leans toward yellow. Little studies like this one work well to keep my color choices calibrated when changing brands of paint. The decision is back to W&N for my next Cadmium Orange purchase. I worked all morning on a large painting. 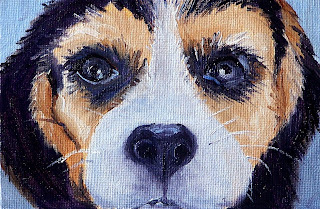 When I finaly took a break, this little 4x6 inch beagle found his way into my heart and onto my canvas. He is actually the third in a series of dog faces I've been working on. I'm not sure how many will eventually be completed, but for now it is just fun to watch their faces emerge. He was created with oil paint on a canvas panel. 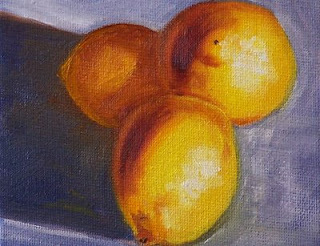 Today I worked on painting fruit. Lemons and lots of oranges. It has been quite a while since I've spent a day doing still life painting. It is nice to be able to paint from life. Most of my landscapes come either from reference photos or my imagination. 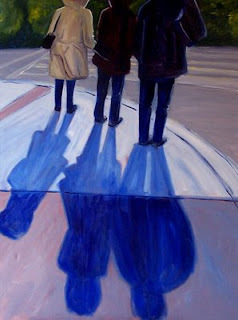 When painting from life, it is a pleasure to note how the light strikes an object and creates shadows. This oil painting is only 4x5 inches. As soon as it dries, I will sell it in my Etsy Gallery. Snow in the mountains and golden leaves on the trees create a delightful contrast. 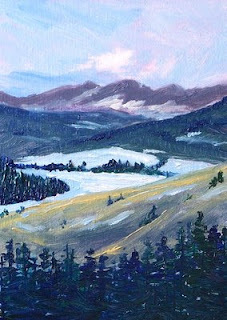 Crisp air and sunshine--before the rains started and the cold drizzle of winter grabbed us all--that's the sense I felt when creating this 5x7 inch oil painting. It can be purchased for $50.00 plus $6.50 for shipping to US addresses by visiting my Etsy Gallery. 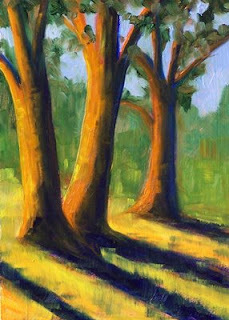 Or, you can view other small tree paintings here. This guy was so fun to paint--makes me think I'll do a few more dogs. This one is just 4x5 inches, but I think it would be fun to create him again in a large size. I have some 24x30 inch canvases in my basement that need some paint. I'll sleep on it. 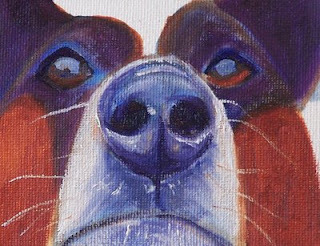 Hope you enjoy viewing this little Dog Nose portrait as much as I did painting it. This week I started re-reading one of my favorite books, Jon Krakauer's Into the Wild. It is a tragic, yet compelling story that takes place in part in the wilds of Alaska in the Denali National Park and Preserve. When reading Krakauer's descriptions, I am inspired to create a depiction of a cold Alaskan landscape. I lived in Alaska as a very young child and have vivid memories of the cold, damp atmosphere. It has been quite a while since I have worked on a still life. This 8x10 inch oil painting was created as part of this week's Different Strokes Challenge. 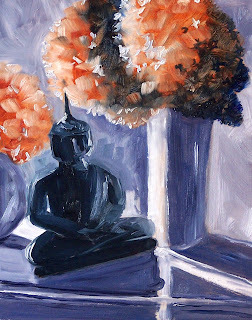 Creating the intensity of sunlight as it filters from behind this collection of dried hydrangeas and a table-top Buddha was an interesting challenge. I'm not completely satisfied with the results as they appear here. There are several things I'd like to correct. When the paint dries, I'll go back and make some changes. This morning I created this little 5x7 inch oil painting with my "frozen paint." Actually, it was not really frozen, but I kept my palette in the freezer for the past few days. Orange and yellow cadmium paints are very expensive, so I always hate to just let them dry up. Instead, I tried the trick of keeping my palette in the freezer. The cold slows the drying. The paint for this little painting was squeezed from the tube a week ago. After six days in the freezer, it was as fresh as ever. A great little trick! This painting is for sale in my Etsy Gallery along with my other miniature landscape paintings. If you click here, you can purchase it for $50.00 plus $6.50 for shipping to US addresses. A 24x30 inch version of the painting can be viewed here. It isn't raining today, but it is cold and early spring leaves are in the distant future. It is still over a month until the days start getting longer again. This 5x7 inch oil painting was inspired by the first green leaves of spring. I'm looking forward to spring again. Winter months are long, cold, and dark. This painting can be purchased for $50.00 plus $6.50 for shipping to US addresses by clicking here. It was created on a gessoed hardboard surface with professional quality oil paints and will last a life time. A gift of springtime would be a delight for most during these cold days of winter. 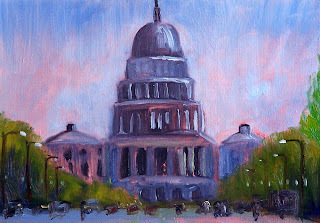 This little 5x7 inch oil painting is characterized by thick paint and complimentary colors. 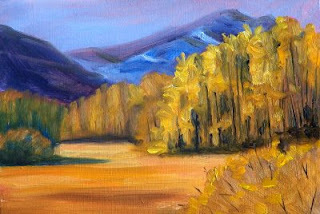 Based on a beautiful autumn grove of yellow aspen, it will take several weeks for this one to dry. When it finally does, I will list it for sale in my Etsy Gallery. This painting is the last of my recent upside down paintings. I am pleased with the way the contrast between light and dark creates a strong sense of sunlight. The advantage to painting upside down is that I don't stop to ask myself what color the jacket might be in the sunlight versus in the shade, I just paint shapes and colors and let it go at that. I had so much fun with my last upside down painting, that another one found its way onto my easel. Looking at my reference upside down seems to ease my anxiety and actually results in a reasonable outcome. Forgetting that something is a leg, an arm, or a head and not worrying about getting it just right releases the anxiety I feel when trying to paint figures. This painting is 6x10 inches which was an ideal shape for this little composition. Today's effort is outside my usual realm of subjects and executed in a very unusual manner. 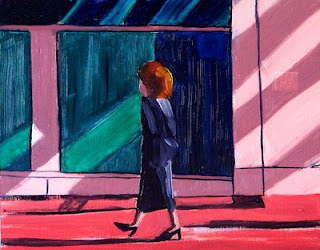 This walking woman comes from Karin Jurick's Different Strokes weekly challenge. Although I've been painting some figures recently, painting them upside down is way beyond my usual working method. Yes, that's right. The challenge this week was to paint upside down. Only when it was almost complete did I turn it right side up and add a couple of last minute touches. It goes to show what I've always known, but seldom practice. Painting shapes works well. If a shape is painted, it doesn't matter whether you paint it one direction or the other, it is still the same shape. When painting, intellect some times gets in the way. Instead of painting what is seen, we sometimes paint what we think the subject should look like and quit actually looking at the actual shapes. This was fun. Upside down painting is probably a practice I should take up more often. The painting is 8x10 inches. The Nisqually River tumbles off the Nisqually Glacier which resides on the side of Mount Rainier, a dormant volcano in Washington State. In the spring and summer this area provides wonderful opportunities for hiking, camping, and whitewater rafting. The course of the river often changes in the winter months as the run off from snow and rain increases. In 2006 during a winter storm, the river chopped off a chunk of the road that takes visitors up the mountain. With the time and effort of many people, the road was finally reconstructed delighting outdoorsmen and lovers of the mountain. This week, to the dismay of many, another recent storm has inflated the river. Visitors higher on the mountain had to be evacuated as the river once again roiled across the road. 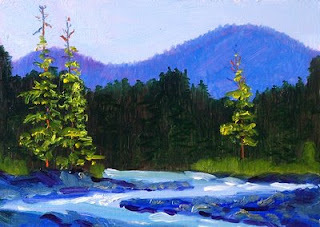 This little 5x7 inch oil painting was inspired by the Nisqually River and the beauty that surrounds it. The paint is thick and heavily textured. Brushwork and paint strokes can be viewed closely here. Click here to purchase. $50.00 plus $6.50 shipping to US addresses. I'm looking out at the rain, listening to a nasty weather report, and wishing I could be in this little 5x7 inch oil painting. Warm sunshine on the leaves of summer trees that reflect in still pond waters looks so comfortable. This painting is characterized by thick paint (impasto) which you can see in closeups at my Etsy Gallery. If you would like to place it in your home, it can be purchased for $50.00 plus $6.50 for shipping to US addresses. Click here to purchase and to read more about materials and purchase policies. After a Veteran's Day of gloomy rain, I am longing for a sunny hike in the woods. A forest of tall evergreens of the Pacific Northwest would be especially appealing. 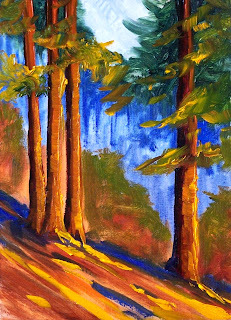 The generous canopy of fir, cedar, hemlock, and pine keeps me going back to the woods. This sunny little 5x7 inch forest scene can be purchased at my Etsy Gallery for $50.00 plus $6.50 for shipping to US addresses. Click here to purchase. 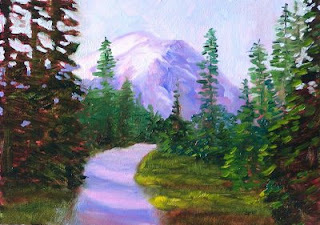 Mount Rainier is one of my favorite subjects for painting. If you haven't visited the Pacific Northwest, it is probably difficult to imagine what is so special about it. On a clear day, it can be seen from Olympia to Seattle and all the way to the Pacific Ocean; but seeing it from a distance is nothing compared to hiking its slopes and trails. It provides breath-taking vistas, outdoor challenges, and amazing natural beauty. This 5x7 inch oil painting was inspired by a trip last summer to Paradise. I have listed it for sale in my Etsy Gallery for $50.00 plus $6.50 for shipping to US addresses. You can purchase it or look at closeups of the brushwork by clicking here. If you have never visited this amazing place, begin making plans now to visit. I'm still working with this same trio of women on the corner. With some suggestions from my friends at the Wetcanvas Forum, I tried a portrait layout of these ladies and lengthened the shadows. They also slimmed down a bit. I moved up to an 18x24 inch canvas. My goal is to create a large painting for the entry at our beach house. The ceiling is nine feet tall and the wall is entirely blank. I want something quite large. A landscape format would cover the wall better, but I want to create something more than just a wall decoration. I'm also considering cropping the top of the figures down to about their waistlines. This is turning out to be a fun experiment. The next version will be 24x30 inches. I have several canvases that size in my basement. I would like to go even larger, but I'll need to build some stretchers and order some more gesso first. Pouring rain for three days and finally the clouds parted. 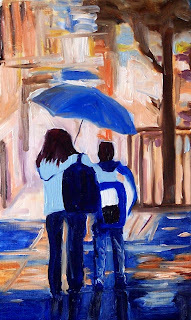 Although created from a photo that Karin Jurick was kind enough to share, this 8x10 inch oil painting reminds me of the recent weather here in the Pacific Northwest. With a break in the rain we often see long shadows such as these. The long abstract shapes were very fun to paint. It is easy to imagine myself with this trio of winter shoppers as they cross the street in search of a sale. 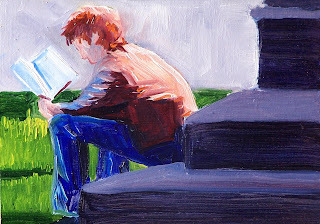 To create this painting, I used a limited palette of Perylene Red, Ultramarine Blue, Titainium White, and just a smidge of Cadmium Yellow Light. 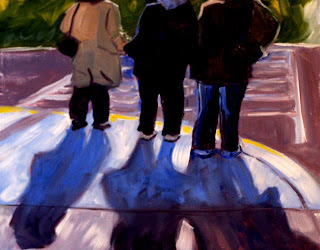 The limited color range, the dark outline of the women and their shadows made this feel like a value study. Although this paintng is just 8x10 inches, I'm contemplating the pleasure it might bring to paint this in a much larger size--possibly 24x30 or thereabouts. What do you think? The November rains are here in the Pacific Northwest. Snow is coming down in the mountain passes. 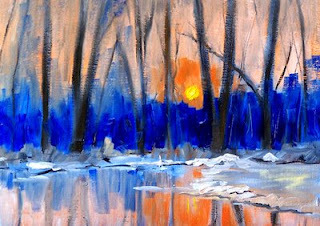 Today's painting welcomes the coming season of snowfall and frosty sunsets. 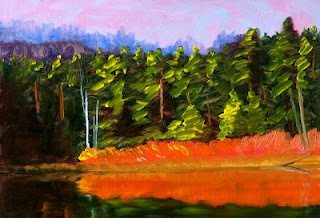 This 5x7 inch painting is another of my reflection series of small format oil paintings. It has thick impasto where the shoreline meets the icy surface of the lake. The complementary colors of blue and orange grab our attention and remind us of the crispy weather in our future and of our past. This painting can be added your collection of small paintings for $50.00 plus $6.50 for shipping to US addresses. Just click here. Additional original small format oil paintings are available in the reflection section of my Etsy landscape gallery. Autumn is coming to a close and winter is upon us. This morning the rain was pouring down and the air was cold. 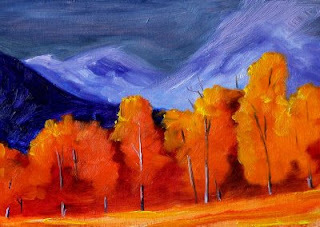 It is with regret that I say good-bye to the fall season.This miniature oil painting helps me remeber a warmer season of cool air and breath-taking color. 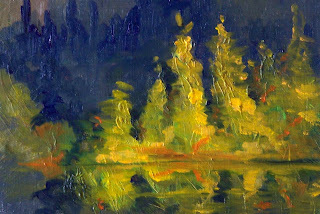 Its 5x7 inch image was inspired by a brilliant orange reflection on a local pond. I have placed it in my Etsy Gallery. It can be purchased for $50.00 plus $6.50 for shipping to US addresses. 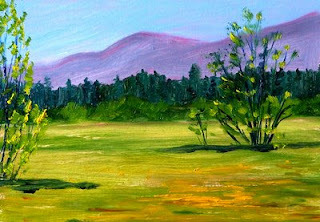 More original $50.00 landscape paintings that would make great companion pieces are listed in the Etsy Gallery as well. The country is busy tonight voting in a historical election. It is all so very exciting. The polls begin to close in five minutes. The New York Times has a live update on its front page that shows incoming results. Because of time zones, the East Coast dominates the news. I will probably be glued to the television news, internet feedback, and the radio all at once this evening. In the interest of self-discipline and maintaining my work ethic, I am still posting my daily painting. Although it may seem insignificant in the midst of this historical day, hard work is what makes our country so great, so I will continue my effort at painting and posting daily. Today's 5x7 inch oil painting is another miniature landscape created with only three colors plus white. Cadmium Yellow Medium, Perelyne Red, and Ultramarine Blue work amazingly well. 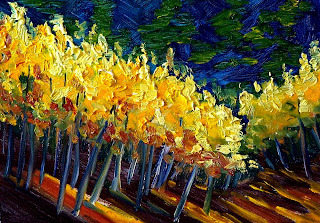 The contrast between the yellow highlights on the autumn trees and the lavender of the shadows, branches, and tree trunks is one element that makes this little landscape effective. The composition works well as does the perspective. I hope you enjoyed my little vision of America in the midst of this very busy day. 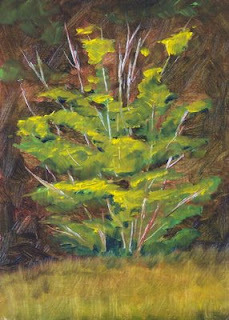 This little 5x7 inch oil painting is based on a small Vine Maple in a nature park near my home. I especially love these little trees when autumn comes because they develop such beautiful foliage. This example isn't showing its color yet, but if you watch your neighborhood forest closely, you may see some of these darling little trees sending out their color. They are found up and down the West Coast of the United States from California to Washington State northward into British Columbia, Canada. They don't grow tall, but tend to huddle under their larger evergreen tree friends. You can see closeups of the brushwork on this painting in the landscape section of my Etsy Gallery. Here's my election week painting. After Tuesday, the endless advertisements will be gone, the squabbling will slow, the US will have a new president, and this little 5x7 inch oil painting will be almost dry. Have a wonderful week and vote on Tuesday.